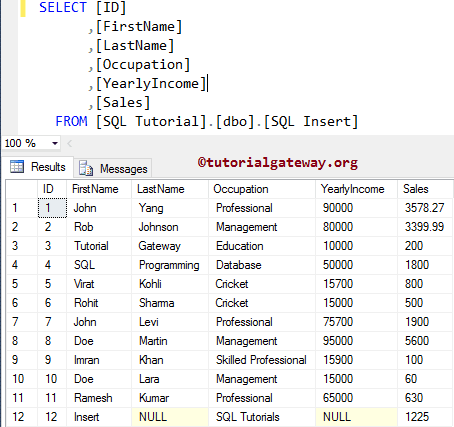 The SQL INSERT Statement is used to add new records into tables or to insert data into SQL tables. Before we get into the practical example, let us the syntax behind this SQL Insert statement. Column1…ColumnN: It allows us to choose the number of columns from the tables. It may be One or more. 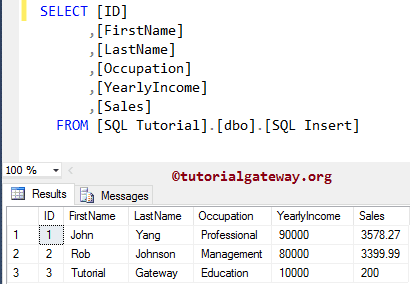 In this Sql Server Insert Statement example, We are going to insert a new record into [SQL Insert] Table in a more traditional way. NOTE: Here, we haven’t inserted the ID value because it is an identity column, and it will be updated automatically. TIP: It is not good practice to ignore the column names. So, always provide the column names. 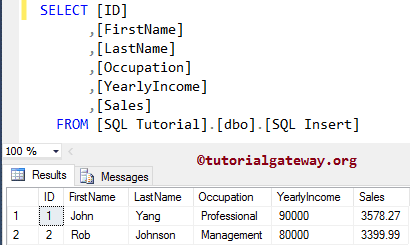 Above T-SQL query will insert data into [FirstName], [LastName], [Occupation], [YearlyIncome], and [Sales] columns. Whenever you omit the field names, you must specify the column_values (field values) in the order defined by the destination table structure. 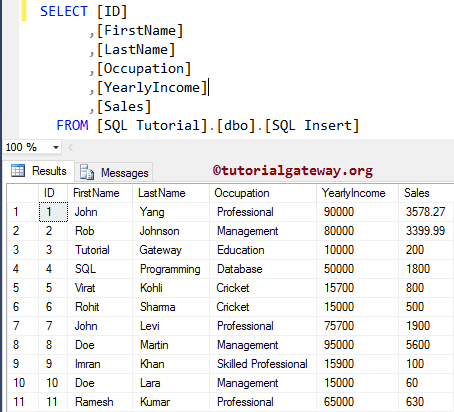 It means SQL value will be inserted in [FirstName] column etc. 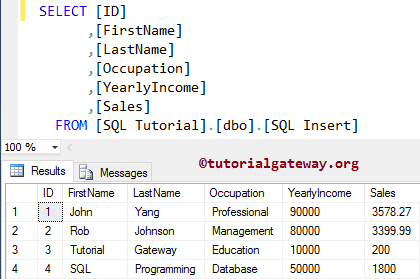 In this Sql Server Insert Statement example, We are going to insert multiple records into [SQL Insert] Table in a more traditional way. Here, We are going use the oldest way to insert multiple records into [SQL Insert] Table. 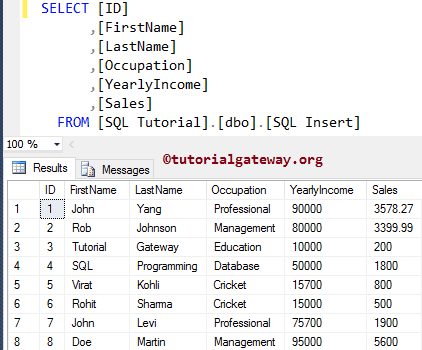 In this Sql Server Insert Statement example, We are going to insert a few Records into [SQL Insert] table. 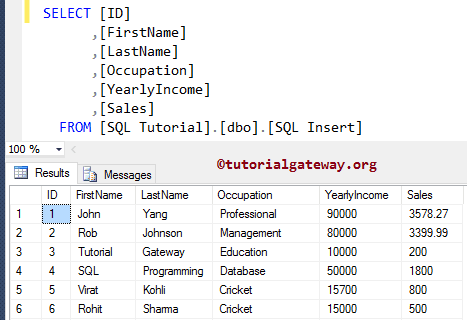 Above T-SQL query will insert data into [FirstName], [Occupation], and [Sales] columns. NULL values is inserted in the remaining columns. TIP: When you are inserting a few records into the table, you must specify the column names. 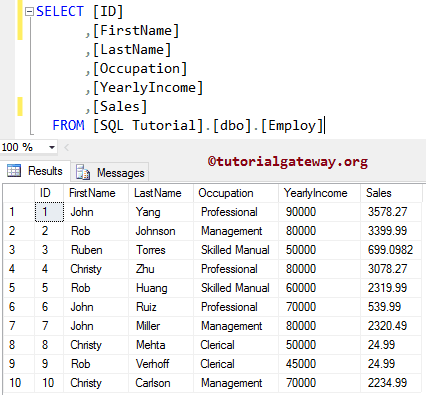 In this Sql Server Insert Statement example, We are going to select rows from the Employ table and insert them into a destination table. Here we are going to restrict the rows using the WHERE Clause. 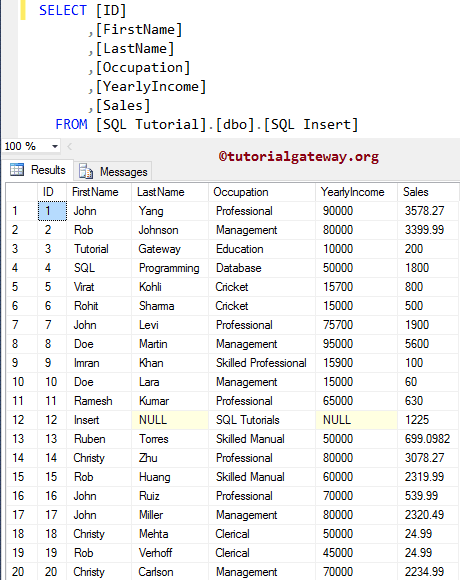 Above T-SQL query will insert [FirstName], [LastName], [Occupation], [YearlyIncome], and [Sales] columns from the source table where [ID] value is greater than 2 into the [SQL Insert] table inside the [SQL Tutorials] Database.